Twit 4 Dead: more silly nonsense with Twitter bots. As a little post-Christmas present, I thought I’d share a little code toy I’ve been working on recently. You might know that I’m a fan of Twitter as a messaging bus, and I’ve already built some entertainingly daft bots in my time with it. Recently, I decided to flex my programming skills a bit and build not one but four bots. And, more specifically: four bots that talk to each other. Enter @louis_l4d, @zoey_l4d, @bill_l4d and @francis_l4d. You might notice that they’re named for the characters in Left 4 Dead. One of the most wonderful things in that game (which I’ve already commented on the brilliance of) is the banter between the four player characters. There’s so much dense, specific scripting, and enough dialogue so that it rarely repeats. 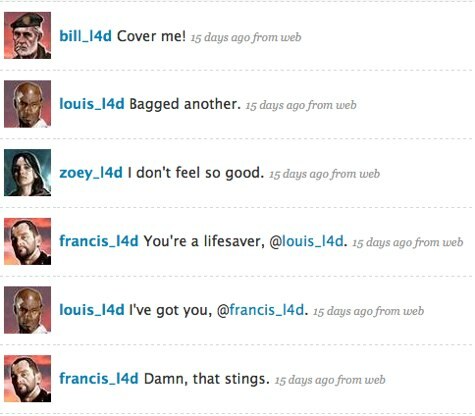 I thought it would be interesting to see if you could simulate the four players’ dialogue over Twitter, sharing some state between the bots, but also finding a way to make them communicate a little with each other. You get the picture. They run a scenario, they bump into boss zombies, they find stuff, they get hurt (and help each other), they get scared (and reassure each other). At the moment, there are some dialogue overlaps; my main work at the moment is adding more unique dialogue for each bot. Bill is sounding pretty good, but the rest of them need work. It takes about 2-3 hours for them to run a scenario, and it’s usually fun to watch. (And, as you can see, it makes sense to follow all four of them). It turned out that rather than trying to build any real AI, it was much more fun just to simulate intelligence. The bots are state machines; they have a variety of states, which they transition in or out of dependent on factors, and suitable dialogue for each state. I wrote the bots in Ruby. There are two main components to the twit4dead code: the Actor class and the Stage class. The Stage is a singleton; it’s where the state of the world is determined, and global variables tracked. It’s also where all the probabilities are run from. The Actor class is what each of the bots are, and it’s based on the Alter Ego state-machine library for Ruby. We have a lot of states, rules for transition, a selection of methods to handle being helped or talked to by friends, and a method to choose a random piece of dialogue appropriate to the current state. All the bots are instantiated from a YAML file. For each bot, I store its Twitter username and password, and a nested tree of dialogue for each state. This means it’s really easy to add new states and maintain the dialogue for each bot. It’s also easy to add new bots – you just create a top-level entry in the YAML file. Originally, I thought about the bots broadcasting and listening over Twitter, but the API calls were just going to get out of hand, and it turned out that Twitter didn’t like being bombarded with messages and would drop a few over time. So I separated out writing the script and broadcasting it. A small utility generates a script file; each line of this file consists of three delimited fields for username, password, and message to send to Twitter. Then, another program – which I currently run on a screened shell – reads that file and broadcasts one line of it every minute until it’s done. And that’s it. I have to run it by hand for now, which is fine – it’s more something I fire up every now and then, rather than something you want to permanently run. I originally was going to keep track of loads of statistics – health, zombies in play, etc – but found a cruder set of rules worked much better. Every time they’re in combat, there’s a slim chance somebody gets hurt; every time somebody’s hurt, a friend will rush to save them. That sort of thing. Simulated Intelligence, then, rather than Artificial Intelligence. Alter Ego turned out to be a lovely library; dead simple to use, and as a result the bots are really nicely modelled (or, at least, I’m very happy with how they’re modelled). The notion of a Stage with Actors, rather than a Game with Players, feels about right, and the modularity of it all is pretty nifty. It still requires a little refactoring, but the architecture is solid, and I’m proud of that. I think my favourite aspect of it, though, is that at times, watching the bots play together is a little like magic. The first time I saw them talk to each other, cover each other whilst reloading, help each other up after a Boomer attacked, I felt a little (only a little, mind) like a proud father. They’re dumb as a sack of hammers, but they look convincing, and that was the real goal. It’s fun to watch them fight the horde amidst all my other friends on Twitter. Nonsense, then, but a fun learning exercise about state machines, object orientation, and simulating conversations. State machines are a ton of fun and if you’ve not seriously played with them, I thoroughly recommend it. Do follow the four of them, if you fancy; I’ll make sure I run them with reasonable regularity, and I’ll be fixing the dialogue over time. After all, I want to keep Francis happy. Nothing out of the ordinary, but the take-on-release tip is a good one, and I'll be checking out Pano.